Speech by H.E. 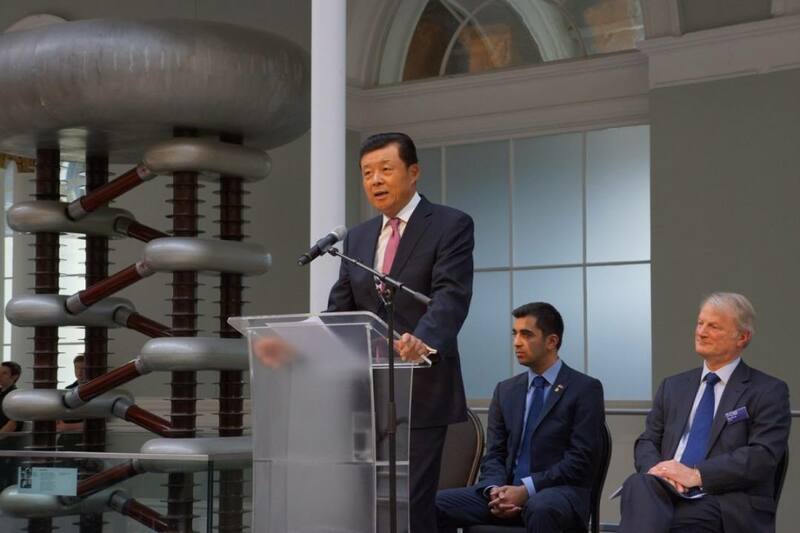 Ambassador Liu Xiaoming At the Opening of the Exhibition "Ming: The Golden Empire"
I warmly congratulate the opening of this magnificent exhibition - Ming: The Golden Empire. Ming was a dynasty in the Chinese history spanning 276 years from the 14th century to the 17th century. China’s Ming dynasty was known for a thriving economy and flourishing arts. China in Ming dynasty was by any measure a ‘golden’ period for Chinese culture. I am delighted that this exhibition is finally unveiled to visitors tonight. 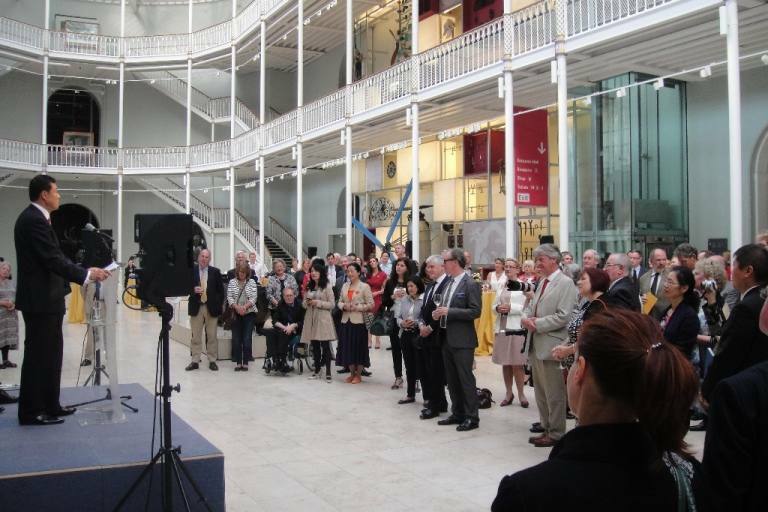 I want to thank the National Museums of Scotland and the Nanjing Museum of China for their hard work and close collaboration. I assure you this exhibition will become a compelling must-see. It presents a fascinating collection of exquisite items and rare objects from the early period of the Dynasty when the city of Nanjing was the Ming imperial capital. The exhibits include fine porcelain, gold, jewelry, painting, sculpture and sumptuous costumes. Each piece is unique and priceless. Through this exhibition, visitors will gain an intimate insight and knowledge of China’s accomplishments in the arts during the Ming dynasty. This exhibition also offers a panorama of Ming China’s political, economic and cultural strengths. Ming: The Golden Empire exhibition is a highlight in this year’s China-UK cultural exchange. Its significance lies in three aspects. First, it is an important event to promote Chinese culture and art in Scotland. In fact the Chinese and Scottish governments signed an MOU on the promotion of cultural collaboration and exchange back in 2011. The current Ming exhibition is a milestone project to implement the MOU. After more than one year of careful preparation, the exhibition is now opened as scheduled. It marks a new level of China-Scotland cultural exchange. Second, this is a symbolic reflection of deepening China-UK cultural exchange. Only one week ago, Chinese Premier Li Keqiang paid a successful visit to the UK. Leaders of the two countries agreed to keep advancing China-UK cultural exchange and cooperation. They also agreed to continuously deepen mutual understanding of the Chinese and British people. To this end, the two sides have set 2015 as a year of China-UK cultural exchange. The Ming exhibition is a great achievement raising China-UK cultural exchange to a new height. It is also a prelude to the year of China-UK cultural exchange. Third, this exhibition is a Chinese cultural feast that can inform and entertain not only Scotland and the UK, but also the entire world. This is because the exhibition coincides with the 2014 Edinburgh Art Festival and other Festivals that take place in this city during July and August. This is a great opportunity as these Festivals combine to be the world’s largest cultural gathering bringing together artists and tourists from all over the world. The Ming exhibition will offer visitors a window to observe China-UK cultural exchange. It is a golden opportunity to experience the quintessence of Chinese history and culture. I have no doubt that the Ming exhibition will add grace to the 2014 Edinburgh Art Festival. In conclusion, I have the pleasure to declare that the exhibition Ming: The Golden Empire now opens!